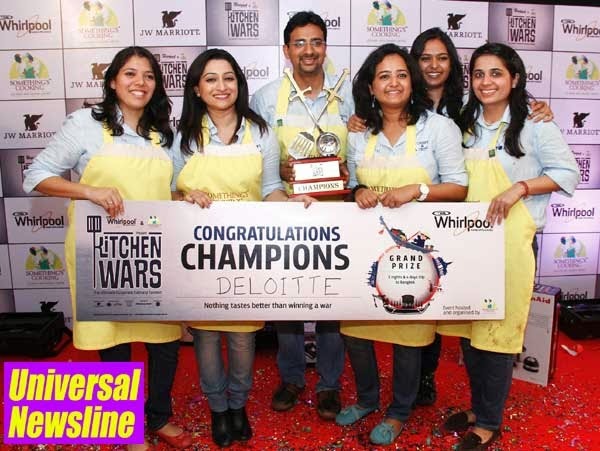 Universal Newsline - Business, Lifestyle, Entertainment : Team Deloitte dons the ‘Kitchen Wars’ champion’s hat! Team Deloitte dons the ‘Kitchen Wars’ champion’s hat! The war has come to an end! Team Deloitte has come out as the champion of Kitchen Wars, the first of its kind corporate culinary contest. It was after rounds of intense competition between 32 corporate biggies, the eight finalists from Deloitte, Infosys, SAP Labs, L&T Finance, Intuit, 3M, Sabre and Mindtree were face-to-face for donning the champion’s hat in the grand finale of Kitchen Wars. The fierce yet healthy competition between the 32 participating teams comprising of six corporate executives, combating for the much coveted ‘Kitchen Wars championship title’ has been an experience one would never forget. Each team plated up their efforts in the most artistic form, which has not just been a sensory delight for all, but also a lesson on team spirit and time management! Decked-up in their kitchen aprons and Chef’s cap, the 8 shortlisted teams, presented the best recipe from their kitchen, in the final run up to win the first season of Kitchen Wars, courtesy Whirlpool of India and Something's Cooking Culinary Arts Pvt. Ltd. All through the season of Kitchen Wars, Chef Jolly, Executive Chef and Chef Daniel, Pastry Chef from the JW Marriot, Bengaluru guided the participating teams in finding the right mix of recipe for a perfect team building exercise. Mr. Satish Venkatachaliah, Founder and Head of the Table, Something's Cooking Culinary Arts Pvt. Ltd said, “As the first edition of Kitchen Wars comes to an end, I am simply delighted by the extreme success of the concept. Not only did the teams experience real life strategy and management initiatives but also came up with such exotic dishes that could give professionals a run for their money. Twists and surprises along the way made the fun double while testing the teams in every way. The state of the art cooking studio gave them an experience that is unforgettable. Having an extremely supportive market leader Whirlpool backing us I can only see us growing from strength to strength and taking the concept and the kitchens nationwide"
Kitchen Wars, a unique culinary talent show, is a platform for passionate corporate houses to participate in an event that is an excellent platform for companies to come together, bond over cooking and foster social interaction with that special ingredient called fun. The competition was organized over three weekends starting July 9th, 2014 where these 32 teams bonded over cooking. The winner of the contest will get an all expense paid trip of 3 nights and 4 days to Bangkok which will include a workshop / demo on French Cuisine or Pastry/ Thai Cuisine/ Food and Wine pairing. The first and the second runner-up will win Kitchen Aid appliances worth INR 50,000 and INR 30,000 respectively. Companies like Infosys, Dell, SAP, Sabre, Citrix, Adobe, Mindtree, L&T Finance, Motorola Mobility, SanDisk, Deutsche Bank, Puma, Deloitte, Adobe, Café Coffee Day and others participated in this amazing culinary battle. Moving to a new contesting ground, boardrooms have now truly shifted to kitchens ! Something’s Cooking Culinary Arts is an idea that brings people together and closer, the old-fashioned way- by the hearth. Our kitchen is where great teams are brewed, friendships are stirred, and ideas are stewed – all for the love of food. Kitchen, we believe is a venue for social interaction; a multi-sensorial experience that witnesses families and friends convene to do more than speak and listen to each other. The happiest homes come together at mealtimes; the best of friends catch up over chai. With ‘kitchen in focus’, we aim to bring teams together from various fields of life, to engage and bond over cooking, for a delicious meal which they prepare themselves.